Cuchuco de Maíz is a traditional Colombian soup from the Boyacá and Cundinamarca departments of Colombia. 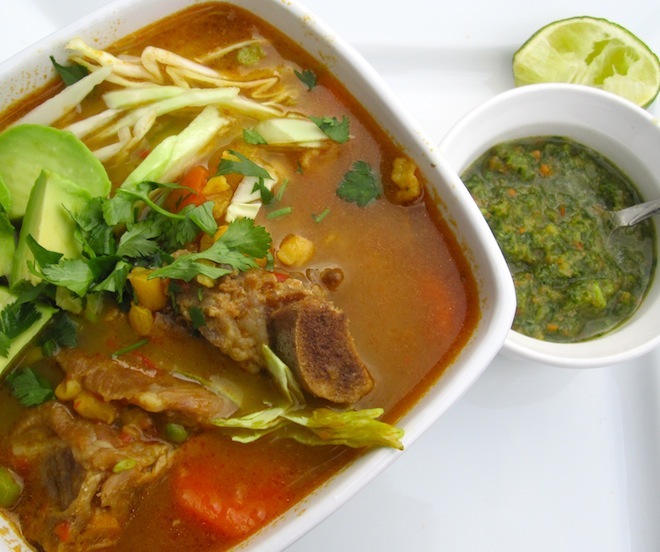 It is a thick soup made with pork bones, vegetables, spices and different grains. There are three variations of Cuchuco, here are the other two, Wheat or Trigo Cuchuco and Barley or Cebada Cuchuco. This is what I call a soul warming soup. Exactly what I expect to eat when I am craving a tasty, filling and comforting soup. Place the onion, garlic, scallions, and red bell pepper in the food processor. Place a pot over medium-high heat. Add the water, beef bouillon, corn, and pork bones, bring to a boil. Reduce the heat to medium-low. Add the onion mixture salt and pepper and let it simmer for 50 minutes. Add the potatoes, cabbage, peas, carrots, Sazon Goya, ground cumin, and flour. Cover and cook for 25 minutes more or until the pork is cooked. Add the fresh cilantro and serve with avocado and ají. That hominy looks wonderful! Can almost smell the flavors from here – the pork bones must just infuse that flavor…. There are a lot of ingredients I am not familiar with but as I see the plate with the soup it looks delicious and I know I would love to try some. Where can I find the dried hominy? It looks amazingly delicious but I do not have all the ingredients…thanx for the wonderful recipes! I use canned hominy, drain it then add it to the pot and follow directions given. Also,, I love it with ox tail instead of pork. Erica, we have similar dish in Brazil…and I miss it so much…yours look delicious…I wish I could have a bowl of this soup. Oh my goodness Erica – this went straight to my comfort-loving, soup-slurping soul. What an array of gorgeous ingredients and they are all in one place! Great soup, Erica. I love the use of hominy in soups. In fact, I like hominy served as a side with meat and fish as well. Mouth watering photos! I love hominy but it’s so hard to find the dried stuff around here! I’ll have to keep an eye out. this looks great! 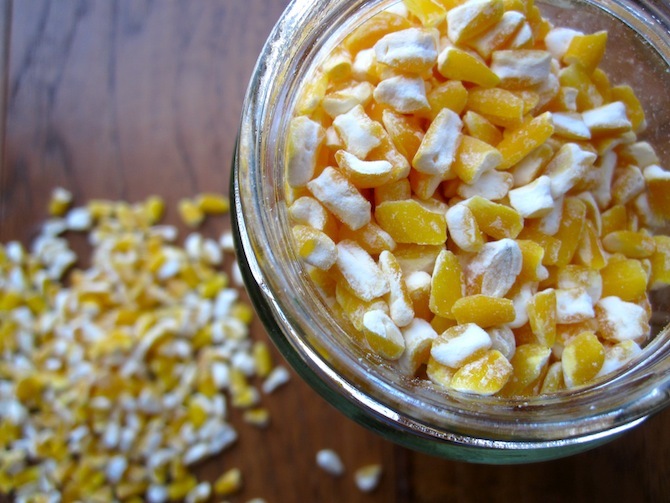 i love finding recipes containing hominy–they’re so rare around here! This would be a great use for neck bones. It looks lovely, Erica. You have the best web site about Colombian food. I was trying to find a good source for my traditional Colombian cuisine and yours is beautiful. I love the pictures, stories. Las recetas Colombians en Ingles mas deliciosas que he encontrado. I just had something like this at my friends house. She is from Cali. 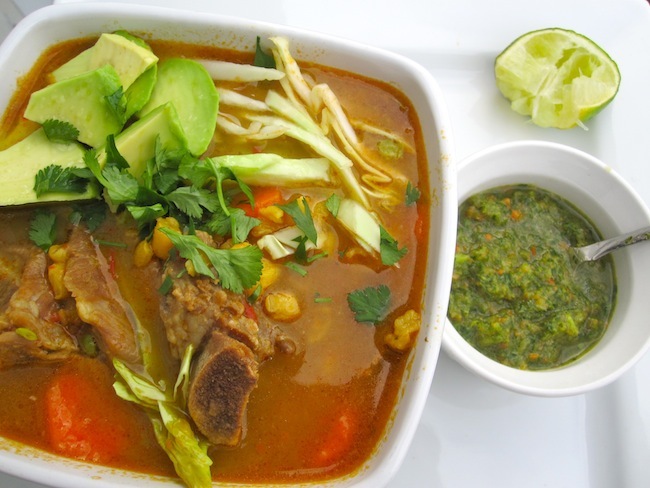 This is a variation of pozole, mexican soup. Is delicious!! Está sopa no es con trigo?